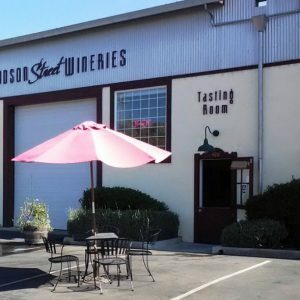 Here at the Hudson Street Wineries Tasting Room we are pleased to offer a fun and unique experience tasting outstanding wines from 5 boutique wineries – Bertapelle, Bluenose, Kelley & Young, Shippey Vineyards and Willowbrook. All in one tasting room in the historic Old Roma Station. Have your next private party, wedding event, or corporate event in an 1898 Old Healdsburg Barrel Room. Room for 100 people standing or 75 for a sit down dinner. Use your own caterer or we can coordinate one for you.